IndonesiaTravelVisit.com | Besides offering the charm of white sandy beaches with crystal clear sea water, Indrayanti also offers the sensation of starry romantic dinner at the restaurant located by the beach. The sun had not been high when IndonesiaTravelVisit.com arrived at Indrayanti beach. Two sea snails moved slowly in a rocks niche, did not care that the wave was sweeping away. A bunch of teenagers was chatting while occasionally posing for picture taken. In the west appeared 3 people were running around chasing the waves, while others were relaxing in middle of the gazebo while enjoying the fresh young coconut directly served with fruit. Some inns conceptualized the back to nature stand proudly beneath the hill, while the stilt house and the huts that resemble honai (Papuan traditional house) were standing near the shore. A yellow jet ski was piled in the restaurant corner. 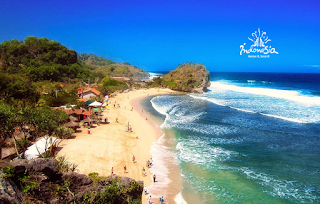 Mentioning the name of Indrayanti Beach ealier got a lot of controversy. Indrayanti is not the name of the beach, but the name of the cafe and restaurant owner. 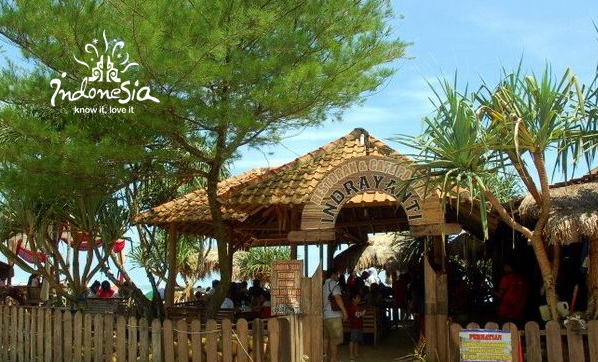 Since the name Indrayanti was displayed on the board of this beach cafe and restaurant, eventually people called this beach by the name of Indrayanti Beach. While the government named this beach as Pulang Syawal Beach. But the name of Indrayanti is more popular and more commonly known than Pulang Syawal. The involvement of private parties in the management of Indrayanti Beach apparently helped bring a positive impact. Unlike the other beaches that are rather dirty, the shoreline along Indrayanti Beach looks clean and free from rubbish. This is because the manager does not hesitate to impose a fine for each waste disposed by tourists carelessly. Therefore Indrayanti Beach becomes a comfortable place to visit. After enjoying a plate of fried rice and coconut ice in the gazebo, IndonesiaTravelVisit.com headed for the hills on the east side. Since there was no road, passing through bushes and shrubs while climbing rocks became an option. Arriving on the top of the hill, the views bounded by the Indian Ocean outspread. Some birds flew, carrying reeds to build a nest. The sound of the wave and the wind combined created a beautiful and soothing orchestra. IndonesiaTravelVisit.com looked to the west. Some beaches separated by hills looked lining up, gazebo and stage house looked small, whereas people looked like a little man. When dusk approached, this place would become a good spot to watch the sun returning to its resting place. Unfortunately IndonesiaTravelVisit.com had to hurry go home. 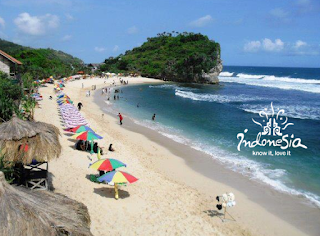 Although not having seen a beautiful sunset, the charm of Indrayanti Beach has been imprinted in the heart. 0 Komentar untuk "INDRAYANTI BEACH , A Clean Beach with Cafe Restaurants"